Blackwork is a counted-thread embroidery worked in geometric designs with black silk on even-weave linen. Black isn't the only acceptable color for working these patterns (red or scarletwork was also popular). 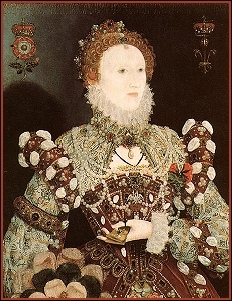 The Elizabethans frequently called blackwork Spanysshe work, and it was traditionally believed that the craft had come into popularlity with the arrival of Catherine of Aragon at the English court. But in fact, there are references to black silk embroidery on body linen as far back as Chaucer. 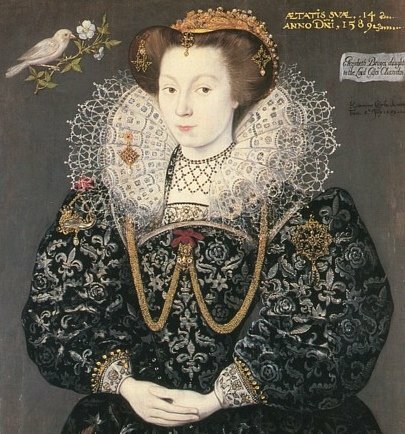 The best way to get a feel for historical use of blackwork is to look at the many iconic portraits painted at this time (consult the bibliography for sources, or visit Tudor and Elizabethan Portraits and the Blackwork Gallery at The Elizabethan Practical Companion). Samplers or examplers are another good source. Long before they became the rote-exercises of schoolgirls, samplers were simply a needleworker's personal record of stiches and patterns. A Sampler. By all means, try out your ideas on a sampler. A partially-worked sampler is a great period accessory. Band collars and cuffs. Dress up plain blackwork bands with box-pleated lace or linen ruffles, and touches of gold thread or gold beads for nobility. Smocks (chemises). 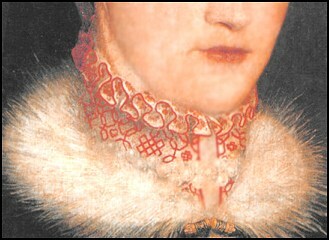 A band of blackwork at neckline of a square-necked smock can peep out above a lady's bodice (see the portrait of Elizabeth Brydges, above right). Handkerchiefs. Anything goes, from a border around all four edges to a single motif in a corner. Cushions. Try small cushions to sit on. Or tiny pin cushions. Blackwork is typically worked in the double-running or Holbein stitch, which is reversible. However, unless your work will be seen from both sides, you may also use the backstitch. 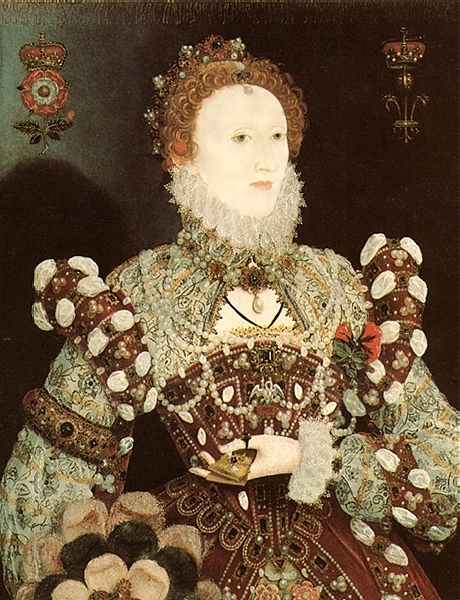 Queen Elizabeth I, The Pelican Portrait attributed to Nicholas Hilliard, c. 1575. Larger image. 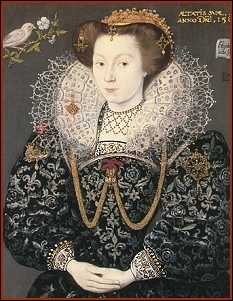 Portrait of Elizabeth Brydges (detail), showing blackwork on cuffs and at the square neckline of her smock, by Hieronimo Custodis, 1589, from Tudor and Elizabethan Portraits. Larger image. Detail of a scarletwork cuff, portrait of Mistress St Lo, later Bess of Hardwick, Countess of Shrewsbury, 1560s. 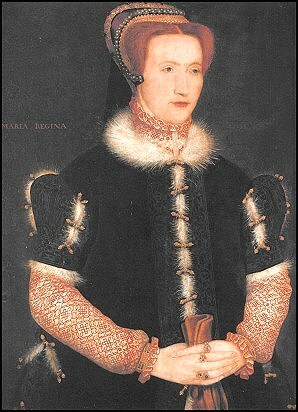 [Misidentified as Mary Tudor.] She is wearing a scarletwork chemise (or possibly partlet and sleeves). Collar detail. Full portrait. Detail of a blackwork cuff, portrait of Jane Seymour by Hans Holbein, 1537. Larger image. All patterns, text, and illustrations are copyright 1985-2002 Paula Katherine Marmor.